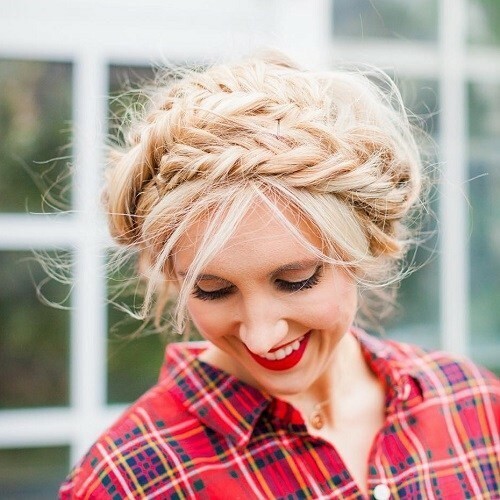 Lots of you have asked for the latest, ‘cute and comfortable’ milkmaid braid designs for summer – so here are this year’s best boho chic milkmaid braids! 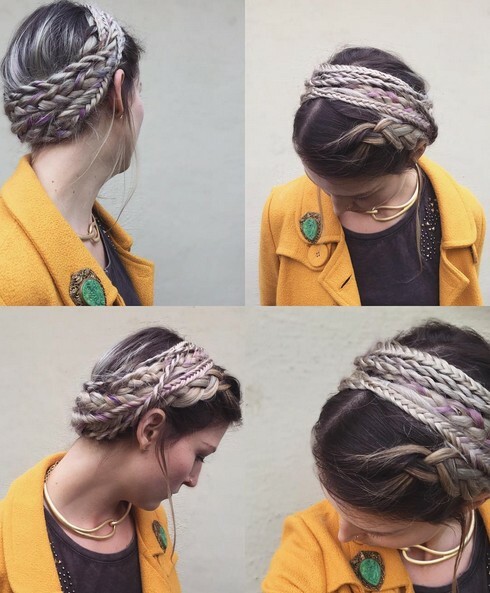 Designs are very varied with contrasting braids and textures, blonde/purple highlights, flower accessories and scarves making cute and comfortable milkmaid braid designs that are packed with contemporary style! Here’s a fabulous boho milkmaid braid hairstyle for fine hair/thick hair, with real flowers adding a charming final touch. The braids can be ordinary thin braids or made with 4-strands for wider braids or by twisting thick hair and then plaiting it! Strongly contrasting blonde highlights make fine hair appear thicker, too! If you’ve got a prom, wedding or party coming up, here’s a new cute and comfortable milkmaid hair design that stays in place throughout the day or evening or both! 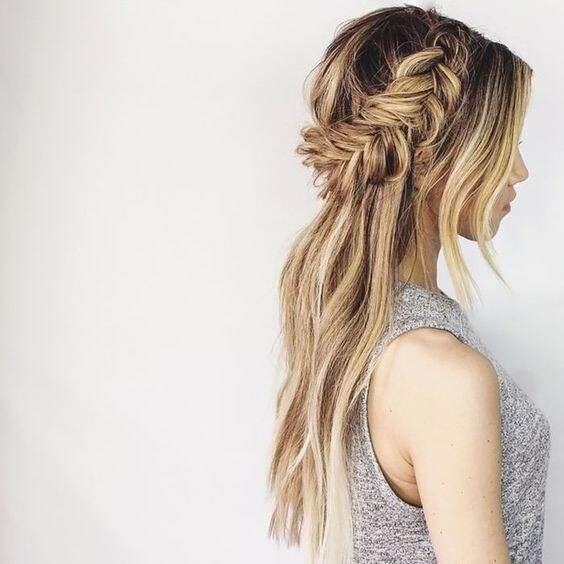 With sophisticated hair color ideas blending 4 blonde balayage shades and reverse plaiting creating a puffy, side braid with tons of texture, you’ll be the most stylish one there! 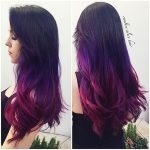 When the weather warms up, long hair needs to be styled comfortably away from the nape and back to keep you cool. This relaxed cute and comfortable milkmaid braid design is an easy hairstyles option that can be braided and pinned up in a couple of minutes! 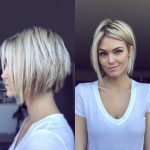 Neutral-blonde hair color ideas are a very popular hairstyles’ color 2016. 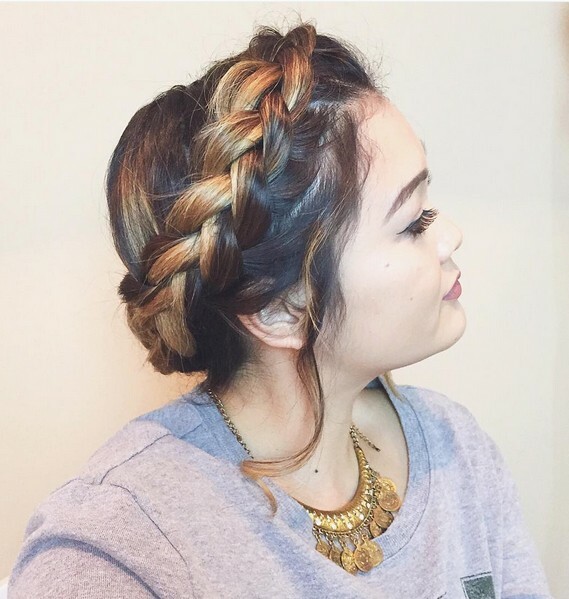 This multi-textured milkmaid braid design is a clever way to create braid upstyles for fine hair or short hair. 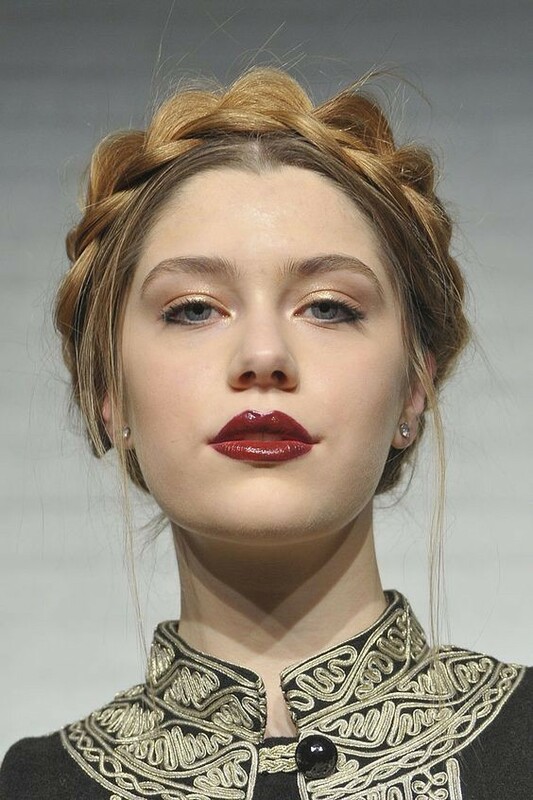 The model’s blonde highlighted hair is used in the wide, head braid above the side parting. Six more thin/thick, neutral blonde braids, create a fabulous mix of textures and lavender highlights! 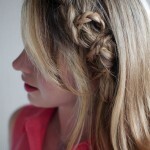 Brilliant use of faux-braids to create easy hairstyles for daily wear and evening upstyles! This is a brand new ‘hat’ hairstyle from the 2016 collection of cute and comfortable milkmaid braid designs! The mix of dark and light blonde shades adds depth to the thick, loosely braided links that resemble a hat pinned neatly to one side of the head. There’s even a faux-feather at the back created with crimped strands! The gold-coin necklace worn by this model accentuates the beautiful golden-blonde hair color ideas used to create a glossy golden contrast with a coffee-brown base. 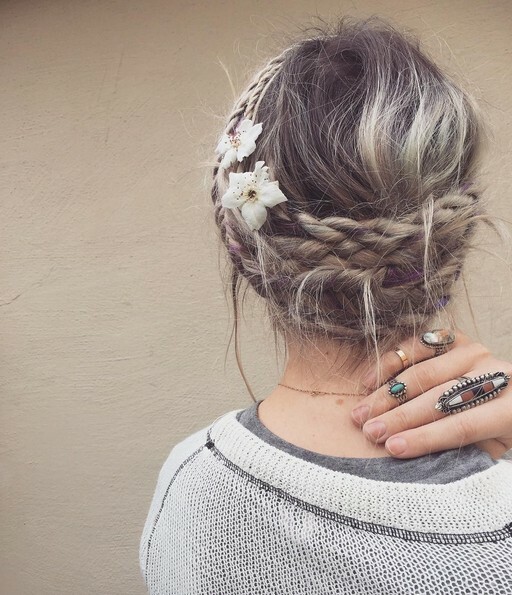 It’s a hair color trend that adds lots of extra dimension and texture to neat, but casual, cute and comfortable milkmaid braid designs for stylish women! 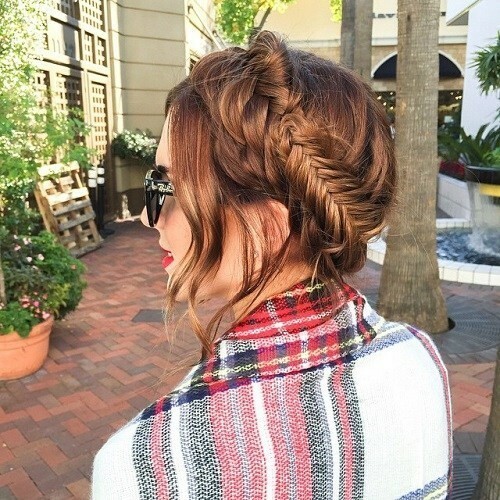 Even popular angled bob hairstyles can be worn in trendy twisted braid upstyles for 2016! This cute and comfortable, milkmaid braid design uses hair-twisting to make a pretty, textured ‘braid’ headband. With a side-parting, casual side-swept bangs and loose strands, it’s a clever new hair idea for 2016 suiting round/oval/heart faces! This is a really easy hairstyles’ idea that’s great for daily hairstyles/evening hairdo’s. Divide hair into two sections as per photo and twist each section down to tips. 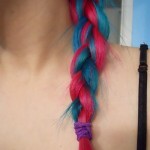 Then twist the two hair strands together, before securing with an elastic at the end. Wear in twists or pin up for another clever, cute and comfortable milkmaid braid design! This rich auburn hair color idea matched with two contrasting braid styles makes a super-cute and comfortable milkmaid braid design 2016! There’s a nice, thick regular braid across the top and coming from the other side is a lovely fish-tail plait making a delightful new pattern, above swept-across bangs for round or oval faces! 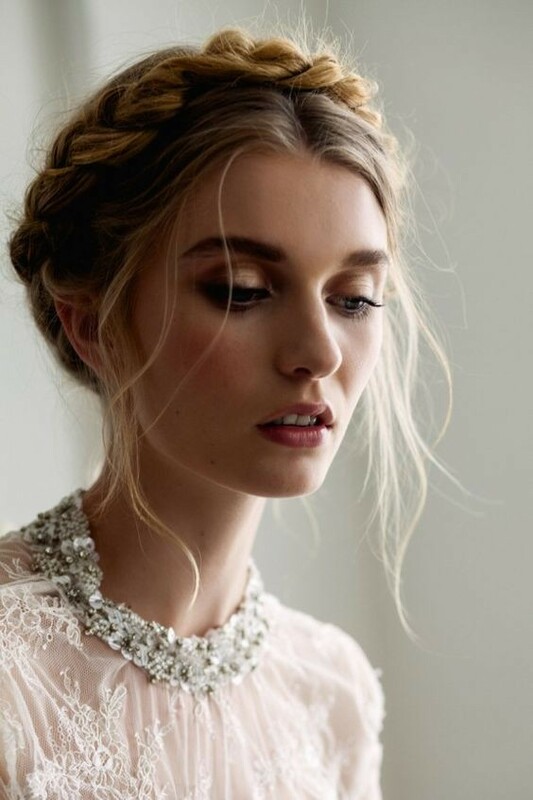 Worn above a dainty vintage lacy dress with a pretty, beaded neck-line, this simple, cute and comfortable milkmaid braid design is perfect for bridal hairstyles 2016. Fussy bridal hairstyles can be more trouble than they’re worth, looking a tad bedraggled by the evening. 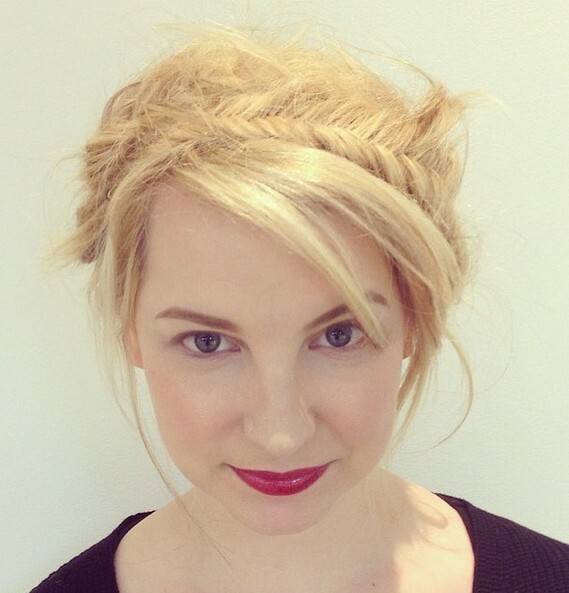 Milkmaid-braids stay secure and with strands softening the face, are always charming! 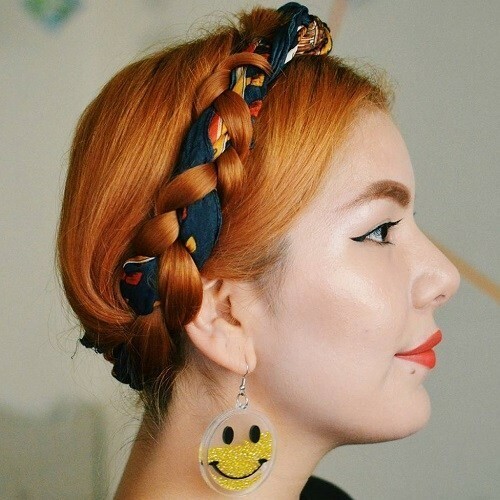 Our busy urban lives are different from 18th century milkmaids’, but cute and comfortable milkmaid braid designs with a modern twist, are still cool summer hairstyles! This gorgeous updo contrasts a loose, wide head-braid and a fish-tail plait creating terrific textures. Pretty highlights and loose strands add the final touch to very fashionable summer hairstyles for 2016. This pretty, braided upstyle for short hair uses uneven braiding at the sides to add even more charm to a lovely look for round/oval faces. The benefits are clear, no fussy curls to worry about when the air is damp, no hair-grips sticking into your scalp and no tension headaches! 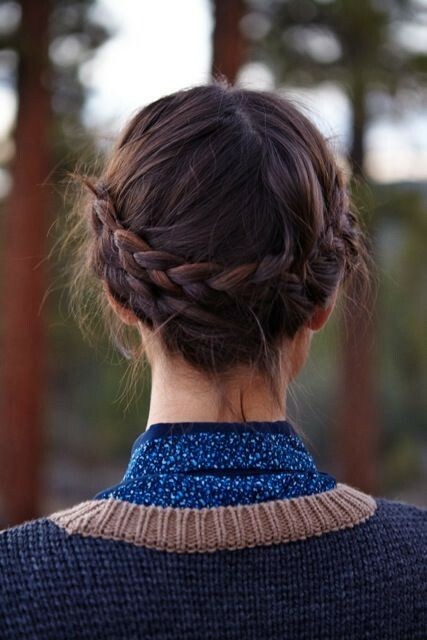 Maybe we all need a cute and comfy braid design for work and play this summer! This ‘cool’ look takes cute and comfortable milkmaid hair designs to new heights of fashionable hairstyling. 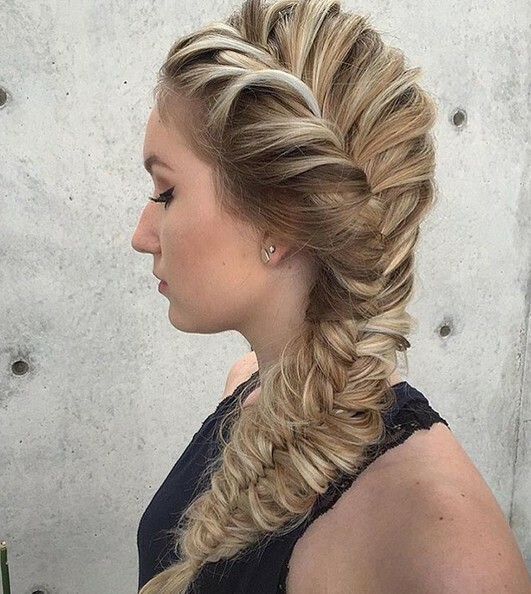 On one side, a loose braid creates a hair-knot adding attractive height, before becoming a trendy fish-tail braid around the back. Loosely waved side strands soften the profile for a relaxed finish to a beautifully textured new braid upstyle 2016. 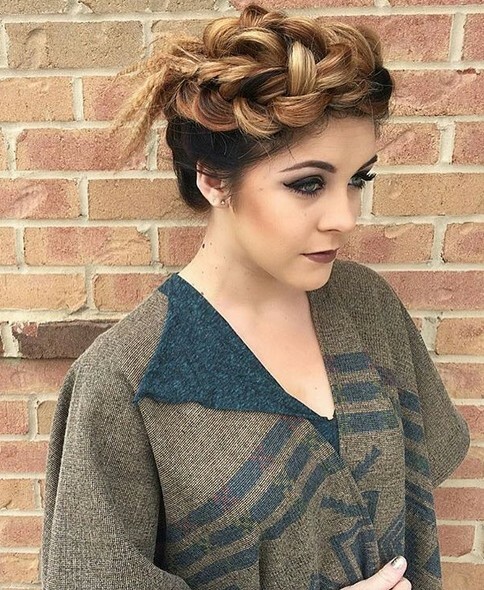 Hair designs for braided upstyles 2016 are a lovely mix of traditional styles and modern interpretations. From a centre-part, this traditional head-braid is kept loose with flattering height on top from gently pulling-out individual links to create a beautiful golden crown effect. Pretty wisps at the sides and back soften the lines in a chic look for oval faces. This easy hairstyles’ idea is a great every day hairstyle that’s cute and comfortable. Braid hair designs always look extra-special with highlights to accentuate the lovely woven pattern of head braids. Wear bangs or a bare forehead at the front to complete a slightly messy, casual braid upstyle that keeps long hair well-controlled! 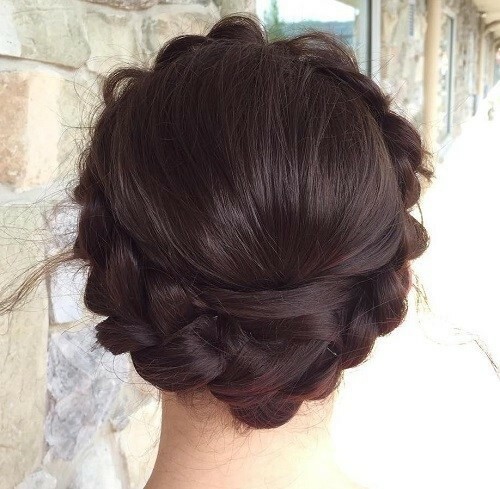 The deep, rich brown shade of this fabulously plaited upstyle and the relaxed, but not messy finish make this regal, cute and comfortable braid hair design perfect to wear with a white bridal gown! The smooth crown is a good spot to pin a wedding veil or fascinator and the knot detail is subtly highlighted with a plum shade above the nape! This long hairstyles’ idea is simple and youthful, calling to mind hot summer days when loose hair frames the face with strands that also soften the line. The half-head reverse braided section creates a nice round shape behind the crown and the lovely balayage blonde highlights create a fabulous pattern and show off the long layers! Copper hair color is amazingly attractive, but it’s the natural hair color with the fewest hairs per square inch, so it’s hard to get a nice fat plait on red hair. But don’t let that stop you! Here’s a very stylish red head braid hairstyles idea showing how to use a pretty scarf to make a thicker ‘third’ strand for a cute and comfortable braid hair design! Keeping cool makes these cute and comfortable milkmaid braid designs very popular hairstyles for this year! 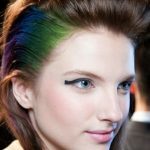 The mixing of braiding patterns and the latest hair color ideas have brought this ever-popular hairstyles idea bang up-to-the-minute for summer!